Oh man, today was a challenging day! Rockin’, Silly Chili, and I got on the trail by 5:40am and we were all feeling great. I really like hiking in the early morning and seeing the sunrise. It was a good one today too! We soon got to a big uphill with switchbacks. Rockin’ is doing amazingly well with the steep climbs and elevation, but it will take this leg or more before she acclimates, so we are moving at a slow pace and taking a lot of breaks. Silly Chili is a superstar and faster than regular thru hikers! He is very patient and does a great job of waiting if he gets too far ahead. The weather was perfect when we got to the top and there wasn’t even any wind so we rewarded ourselves with a long Internet break. It had to be at least 40mins. All three of us had service. Rockin’ and I worked on our blogs and did some texting, emails, and phone calls. Silly Chili is starting grad school to be a paramedic in the fall and is completing two (soon to be three) online prerequisite courses, so he worked on that. After our extended break, we started on the big descent. As we got toward the bottom, I looked back and saw the rest of the crew I’ve been hiking with was on their way down. I thought they’d be close because we camped much earlier than planned last night and there are few sheltered areas to choose from. We leapfrogged the rest of the day and it was fun to see them so soon. 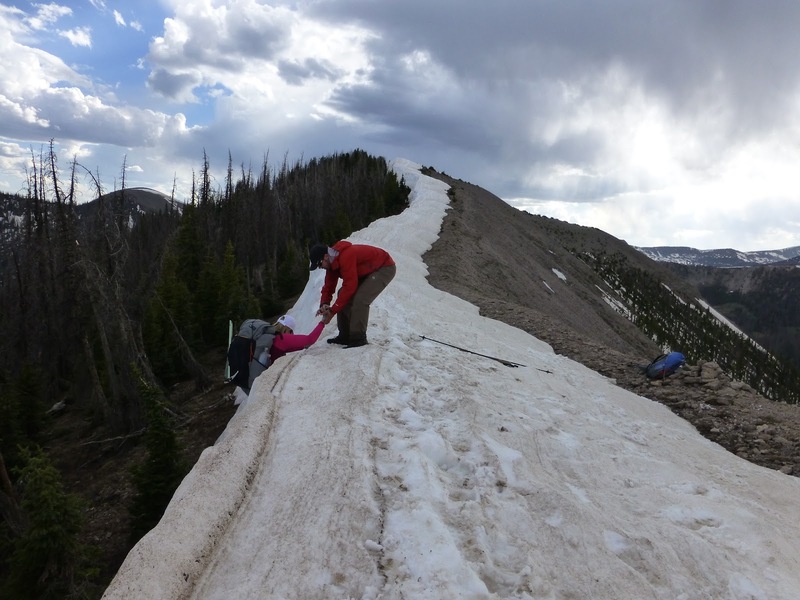 In the late morning, we hit the longest and most draining snowy sections with constant postholing. Silly Chili took the lead most of the time breaking the steps and it was regularly knee deep or more. He did a TON of work! All of us postholed numerous times as our full leg would fall through. It was absolutely exhausting and really demoralizing. 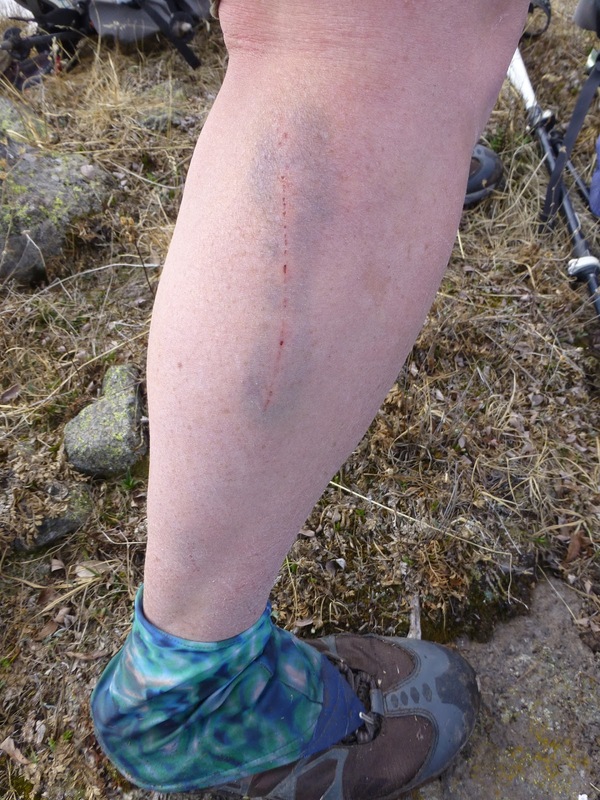 Here is a picture of a bruise and scrape I have from a posthole in the woods yesterday. 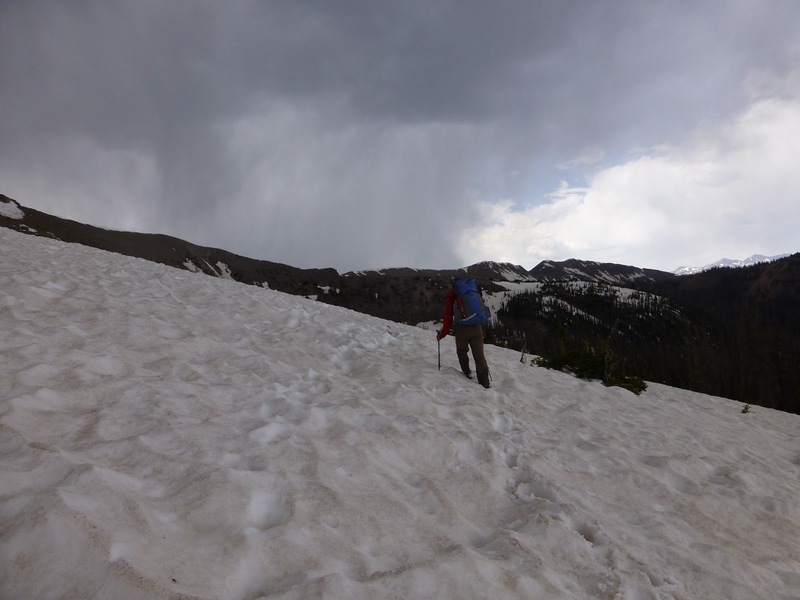 It really is dangerous because you step on snow that just caves deep and your full weight with a pack goes down onto whatever is under that snow. In my case, it was a large stick that jammed me in the calf. Ouch! *Notice my new Wired colored Dirty Girl Gaiter too. Every time we would get over a ridge or around a corner we’d have hope that it would end and then there would be a whole field more ahead of us. Here is Silly Chili leading the charge. The weather was very unpredictable today. One minute you’d feel like you needed a tshirt and shorts and the next there would be snow flurries and gusts as dark clouds floated by. It was really annoying because we couldn’t get a rhythm today with all the deep snow and the stopping to change layers because of the weather. My feet also got really cold when the weather went through its extended cool periods. I had grocery bags to put on my feet at these moments, but they were buried deep in my pack somewhere and I didn’t find them til I was at camp tonight. At the end of the day, another hiker named Whuppin’ Stick caught up to us. He’s one of the speedy ones who started a week after we did who has now caught up. Doubt I’ll see him again because he kept hiking further than we camped tonight. He said his mom is a fan of my blog, so HI to Whuppin’ Stick’s mom! He let us know that some others are just behind us who we know from PCT 2011 who should catch up to us in the next couple of days. 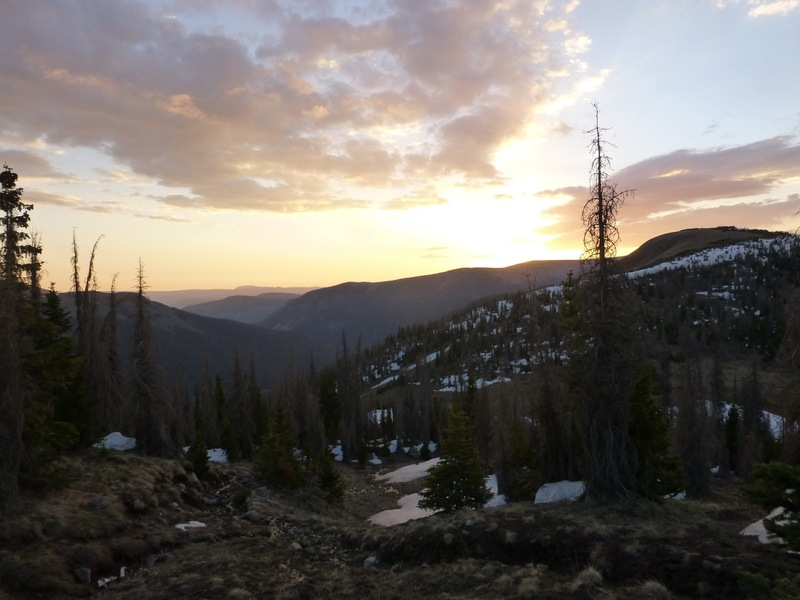 The end of the day was pretty epic…out here it is difficult to find camping with limited areas that are flat and dry where it is low enough to be sheltered. Rockin’ was really feeling the elevation on the final long uphill which is to be expected. The rest of the group hiked on ahead and I stayed back with Rockin’. 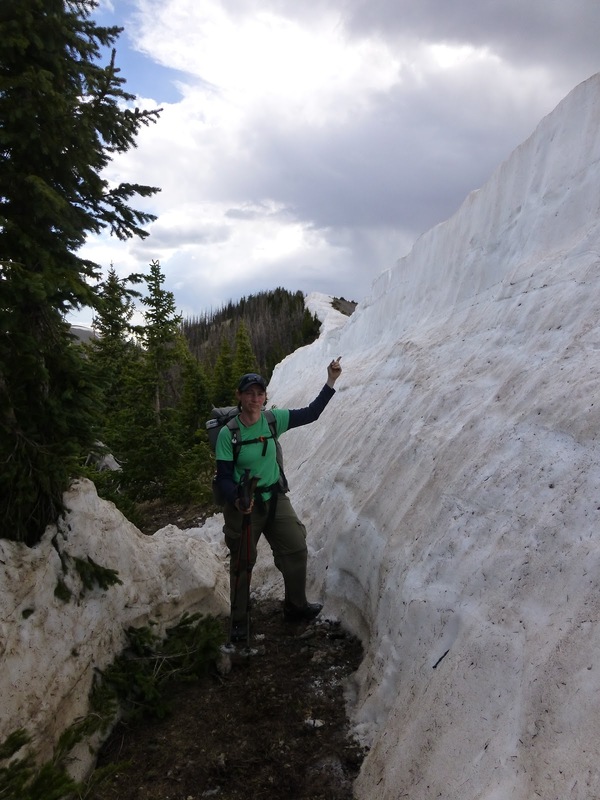 We soon came upon this big wall of snow over the trail right on a ridge. Not just any ridge, the exact Continental Divide! Silly Chili peeked out from the top and had thankfully waited to help us get on top of the large drift since the trail was on the actual Continental Divide for 2-3mi. It was really cool to be up there on the spine of world! 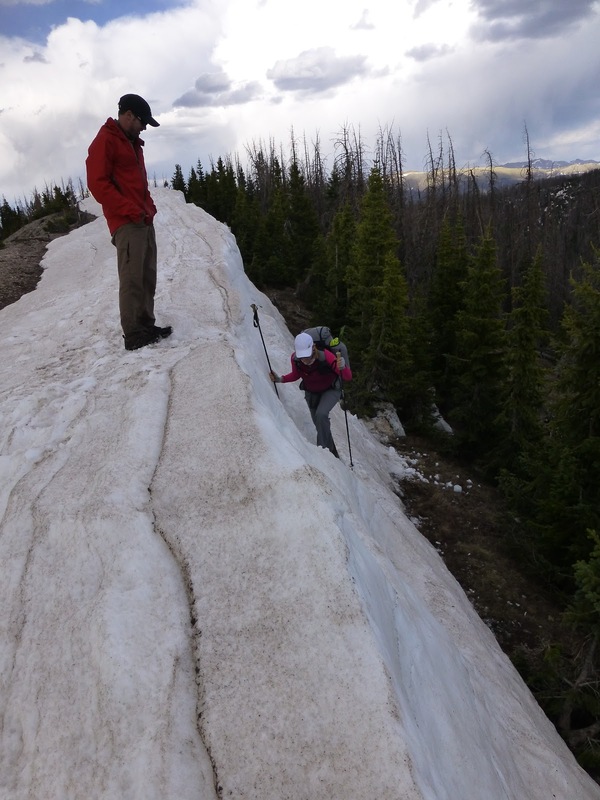 Here we are getting over the wall of snow and then on the divide.